This is our last week focusing on the Earth. The kids have really enjoyed the month long unit. Although, I'm always ready to move on to the next unit by the month's end. I must admit, I'm in the middle of writing the kids' syllabuses for next year, selecting text books, and writing IHIPs, as CSE meetings are just around the corner. It has been suggested to bring all of that with me when I go, in hopes for a better experience with the district etc. So, a little less time has been spent preparing my week's worth of activities. Hopefully next week I'll have a bit more time. We've done this activity before but everyone loves it, which is a HUGE deal when it comes to writing, because well... Not a single kiddo in this house enjoys writing in any way. Dinomite writes his letters next to the ones already written. Bulldozer and Princess, trace the letters already there. Not only do they work on uppercase letters, but also lowercase letters. Though not shown here, I do want to mention, besides the activities I share here each week, all three kiddos have work time in the morning. Dinomite has a journal. Mommy writes a simple question every day, relating to the theme of the week and month. He writes the answer to the question. There is also space in the journal to draw a picture to go along with the question and answer. It has taken a long time for Dinomite's anxieties to lessen, in regards to this task, but with incentives, reinforcers, and a lot of cheering, he's doing fabulous. Writing and drawing are two of his least favorite things. Dinomite also does his reading in the morning. He's now almost finished with his second set of Bob Books. Oh how I love them! We read a the same story each morning, until he reads through it with no errors or questions, and then move on to the next one. Usually this only takes two or three days at most. Then we use a simple School Zone workbook so he practices his skills and gets a little bit more writing in. Usually Dinomite can only handle doing 2 pages of the workbook, at his grade level, before he's burned out, but still, that's enough. The whole process takes about 30 minutes in the morning. Bulldozer and Princess just do pages in their workbooks, usually five, as their workbooks are much easier, and they don't have any other work. Starting in July, they'll each have a writing task to complete in their own journals. Of course it will be age appropriate. I am not one to spend any money purchasing cards and printables online, as I just don't have the funds to do so right now. Almost everything you see on my blog is free. However, I did splurge on these cards. This activity includes two sets, both were 10 cents each. Yes, you read that right! Each set was 10 cents! Though some of the animals are not technically "endangered," they are threatened etc. The description cards are wonderful, although definitely written for an elementary aged child. I went through each card with Dinomite, reading them aloud. Then we worked through all the big words. It went very well. For Bulldozer and Princess, matching pictures with names will be sufficient. Source: These cards are available at Montessori Helper. Click HERE for the second set. Dinomite worked on learning how to tell time earlier in the year, but I've noticed he's forgetting. Bulldozer and Princess have never worked on telling time. I've hesitated putting an activity on the shelves regarding time, just because only Dinomite can work on it. That was, until today. I just happened to glance at our telling time flash cards as I had just finished going through some fun manipulatives a relative gave me. I love it when ideas come together! Step 1: Matching the time on the clock with the time on the card. For Bulldozer and Princess, the whole purpose is to introduce them to the clock. They are to make the hands on clock match the clock on the flashcard. Step 2: Identifying the actual time in numbers. Once they've done so, they can turn over the flashcard and look at the time. Mommy and Daddy are doing this with them for the first little while, to help them learn how to say time. Then hopefully they'll be able to do it on their own. Dinomite is to match the time on the clock and then without looking at the back, tell the time correctly. He can then look on the back to see if he is correct. How Many Endangered Species Are Left? Mommy and Daddy spent a lot of time researching endangered species this weekend and came across a list of the top ten most endangered species. After looking up numbers, to see exactly how many are actually left, we created a graph activity for the kids. The information sheet includes pictures of each animal for the kids, so they know which one is which. All they have to do is find the number, if they can't read. For Dinomite, we included less than and about phrases he has to interpret. Once the graph is completed the kiddos are asked to tell us about it. Source: I created this printable as part of my Endangered Species Printable Pack 1. For your free copy, click on the link located at the bottom of this post. We did this activity a while back, but last night I thought of it again, when I realized that most animals in the package are endangered. The kiddos sort a few of the crackers, and then practice making patterns with them. This is one of Bulldozer's favorite activities, especially when he gets to eat the broken ones. Source: This idea came from Squidoo. I have been trying to come up with ways to teach the kids the 5 oceans. There are very few songs out there that include all 5, and well just so little info out there in general. A while back I stumbled across these cards. This week I decided to pull them out again. If nothing else, they will help the kids identify the names of the oceans, and notice the many creatures that live in the oceans. Source: I found this activity at bogglesworldesl.com. In attempt to review our continents and once again work on learning our ocean names and locations, I brought out our maps to color and label using the Montessori continent colors. I included a map of the world, so the kids could find the oceans, to know where to label them. Sources; The map coloring page is at Crayola. The continent cards were part of an animal activity we did a while back. They can be found at Walk Beside Me. In an effort to try to help the kids understand why animals are endangered, I created Healthy Habitat cards and Dangers to Habitat cards. The kids were asked to match the cards up. Each habitat could technically be affected by each danger, however for their little minds, match ups made the most sense. So far, they've really liked the cards. Two out of three kiddos have commented on how sad the dangers are and want to do something about it. I'll admit it was a very sad activity to put together, but one they really do need to understand to make a difference. Source: I created these cards as part of my Endangered Species Printable Pack 1. For your free copy. click on the link at the bottom of this post. My kiddos are very familiar with the food chain in regards to the Grasslands of Africa, so I didn't make up cards to match up, but instead put a basket full of animals with some plant life. I ask each kiddo to explain the food chains to me and tell me who eats what and who. They do a fabulous job! A friend gave us this little activity, so I figured this week was a goo time to try it out. My kids love sensory bins, and I just couldn't resist including a couple this week, my first being the Arctic sensory bin. It includes several Arctic animals as well as several different kinds of white and blue beads, gems and stones, cotton balls, and plastic glacier figures. The best part was that all of it was on hand in our house! This is one of my favorite activities of the week and a great visual way to teach kids about oil spills. I loved that it included so much fine motor skill work! Mommy initially covers all of the water animals up with black play-dough. It is then the kiddo's job to rescue them all, removing all of the "oil." The kiddos enjoy the process so much, that they decide to cover the animals with play-dough and rescue them again! I must say, I was pretty pleased with how this sensory bin turned out, and again, all of the contents were available at our house already. The bin includes: several rainforest animal figures, a variety of green and blue beads, green pom poms, plastic plant life, brown popsicle sticks and green popsicle sticks. Dinomite really enjoyed playing with it today. My kiddos don't really enjoy having their eyes covered, especially Bulldozer who is so visually oriented. However, they are liking this activity so far. We study the animal characteristics, then I blind fold the kiddo. Once I know they can't see, I spread the animals out on the floor in front of them. They pick one up at a time and try to identify the animal. It's working pretty well I must say! Lastly, I included an art activity. Dinomite and Princess seem to really enjoy the step-by-step drawing cards. This week I included an elephant and a whale. Sources. The elephant cards can be found at How to Draw 200 Animals. Click HERE for the whale cards. Next week we start our Human Body Unit! I'm excited and nervous, but I'm sure we can do it! You really come up with great activities. I'm trying to make a mental note of some of the ones I like best so that I can use them in the future. :) I'm glad you posyt your activities. Thank you so much for your kind words. They mean so much, especially coming from someone who has so much experience, knowledge and expertise. Your comment has really made my day! These ideas for animals and the Earth are wonderful! We did a cool idea too you might like. I love how you laid out and presented the activities. Such a nice job. I saw this on the mom's library. Thank you so much for the compliments. They always mean a lot. I'll be sure to check out your activities! Visiting from TGIF Friday. I'd like to invite you to my Friday Flash Blog, where you can share your best blog entry of the week! And who knows, you may just get featured next week. What an amazing collection of ideas! Thanks for sharing at Mom's Library! Thanks so much! Feel free to stop by as often as you'd like. I update activities every week! What a splendid theme to explore! I really like the oil spill tray. Brilliant idea. And by the way: I like the new blog layout! Great unit. 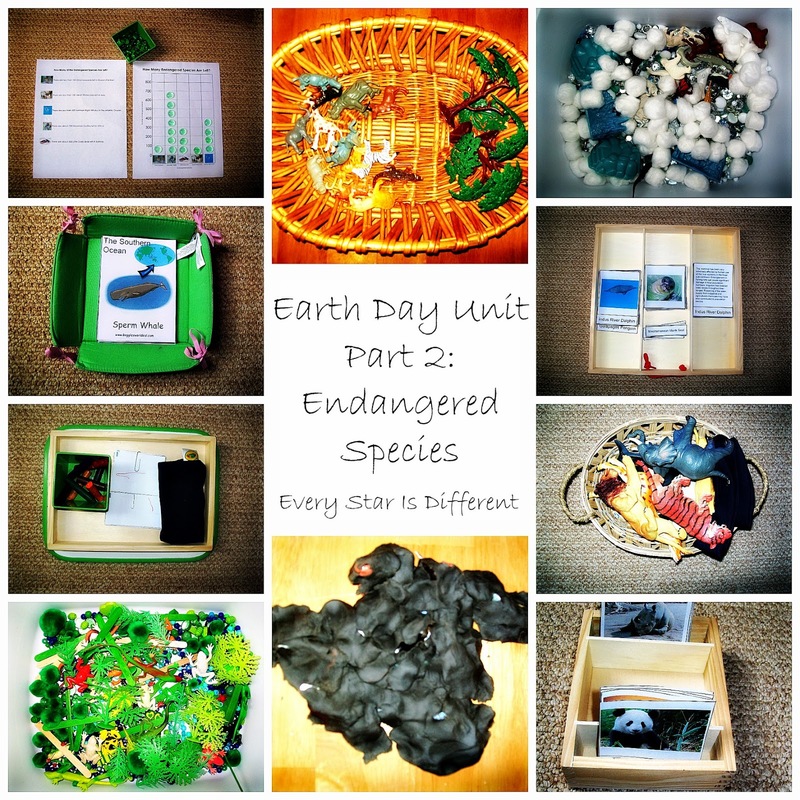 I am adding your post to my Earth Day round up next Monday for After School Link Up! Great ideas and activities! I really like the one using Animal Crackers. If you have time, come check my book about rainforests and preserving them through a poem with yoga poses. Maybe you will consider using it in your classroom in the future. Keep up the great work; and thanks for all you do to keep the kids engaged while learning!